One of the highlights of any beach holiday is that time of day when the sun sinks and the purple, reds and oranges of the sky meld together over the ocean. It speaks of tropical, magical paradise and Koh Samui has plenty of spots from which to witness this daily, yet none the less spectacular event. Below is a list of recommendations of the best sunset bars on Koh Samui according to the Villa Kalyana team and guests. 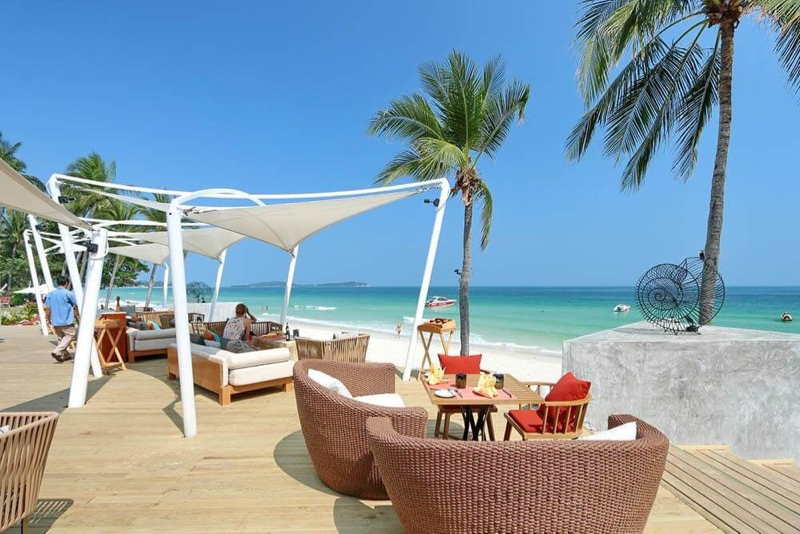 Koh Samui is blessed with some first class, cool contemporary bars in some stunning locations. Chic, funky designed décor and furnishings have the cool, stylish holidaymaker in mind. Fabulous, memorable views, great tunes and classic cocktails all make for a splendid sunset venue. 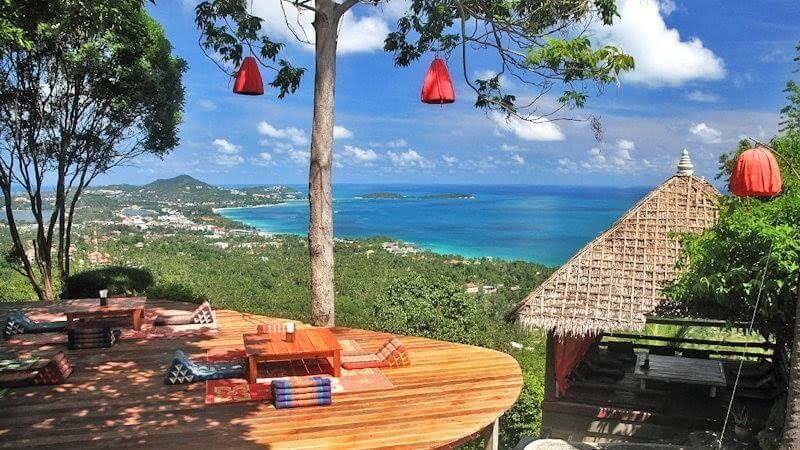 Just around the coast from Villa Kalyana, dramatically set on the cliffs overlooking Taling Ngam bay is the Air Bar. A super chic cocktail bar with large decks set out from the rocks with uninterrupted sunset views over the ocean and the Five Islands. World class mixologists stir up a range of fabulous cocktails while chill out tunes play to the beat of the setting sun, creating a cool and vibrant atmosphere. Once the sun goes down, a live saxophonist and singer take centre stage to delight the guests with gentle Jazz numbers. With attentive and friendly service, Air Bar won’t disappoint even the most discerning of cocktail bar aficionados! 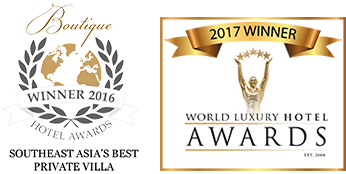 The concierge at Villa Kalyana can arrange a car and driver or taxi. It takes about 10 minutes. Make sure to take advantage of the 2 for 1 Happy Hour cocktails. For a beachfront cool bar, you can’t ask for much more than Coco Tams on Bophut beach. Look out for the large comfy cushions and low tables lining the beach, listen for some great tunes flooding the shoreline and you’ve found this gem. 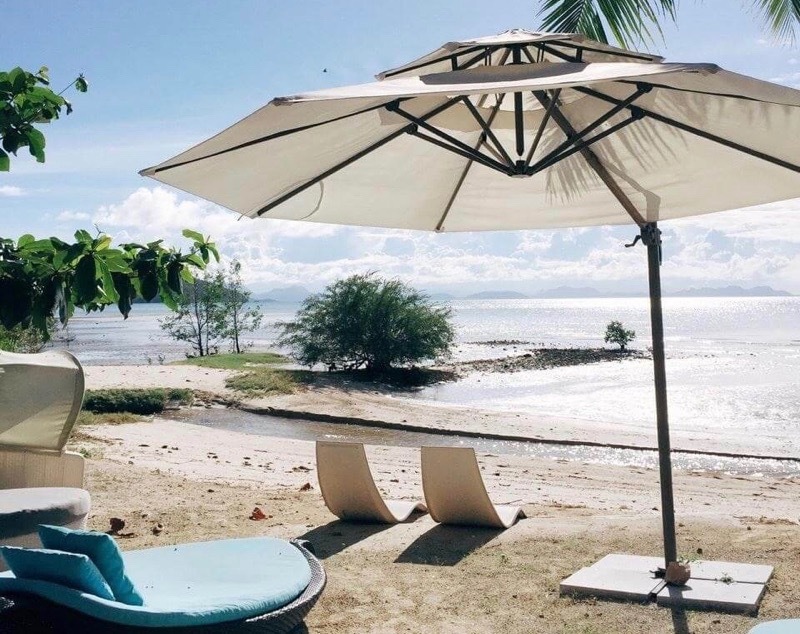 Settle yourself into the first row of cushions, order your Pina Colada or Mai Thai and watch the sunset unfold. If you prefer pulling up a stool at the bar, then try one of their swings that hang around the bar, for a change. The service is great, the cocktails reasonably priced and the location perfect for a sunset with sand between your toes. Once the sun has gone down, stay on and be amazed by the fire show as local lads defy the fear of fire and twirl some amazing routines. We recommend combining a trip to Coco Tams with a browse around Bophut Walking Street festival on a Friday evening. Koh Samui was long the haunt of the backpacker due to the Thais’ understanding of how to create great chill out areas with a friendly and laid-back vibe for the weary travellers. Many of these rustic haunts have retained their charm and feel and are great for cheaper alternative cocktail hours. Just a 10-minute drive from Villa Kalyana, takes you to the rustic, laid-back beach bar I-Talay on Taling Ngam beach. Your visit starts with a warm, friendly welcomes as you are shown to your shapeshifting bean bag on the terrace or comfortable round armchair. Of course, the view goes without saying and the atmosphere takes you back to the simplicity of Koh Samui beach life. Make sure to be there between 4-6.30pm for Happy Hour. 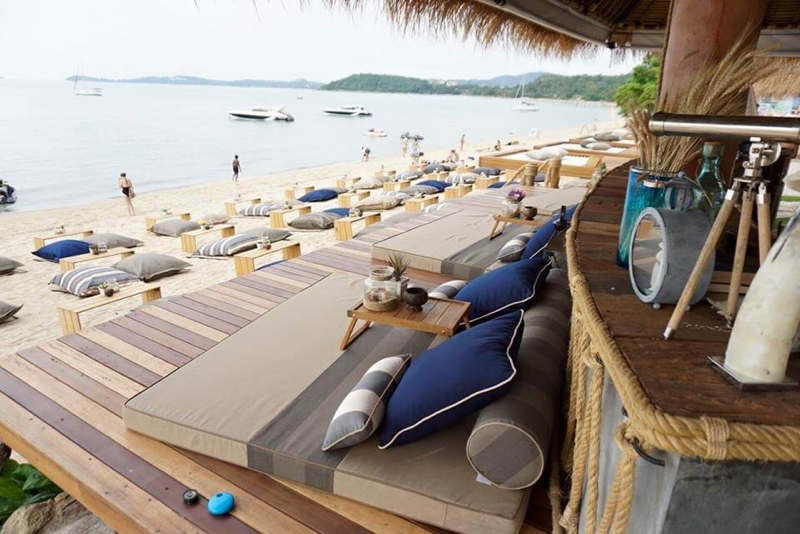 See http://www.samuibeachbar.com/16012680/about-beach-bar for more details. Another sunset beach bar with plenty of old-style charm is La Java located on the quiet beach of Thong Krut – just a few minutes’ drive from Kalyana. Settle yourselves into one of their canopied beach chairs dig your toes into the cool sand and watch the sunset unfold with a glass of wine or a cocktail. When the tide is out spectacular colours play across the wet sand turning the whole bay into a purple palate silhouetting the fishing boats in the distance – perfect! Very accommodating French Thai management who would be more than happy to reserve the best seats in the house. This Jungle Club takes a bit of planning and organising to get to but is so worth it. A long term favourite in Chaweng Noi amongst locals, expats and tourists and for good reasons. The adventure starts as your pick up jeep climbs the steep road up the mountainside. The rustic Jungle Club is at the top nestled in a coconut plantation with individual thatched, bamboo pavilions dotted around and a huge deck with the classic triangle Thai cushions. 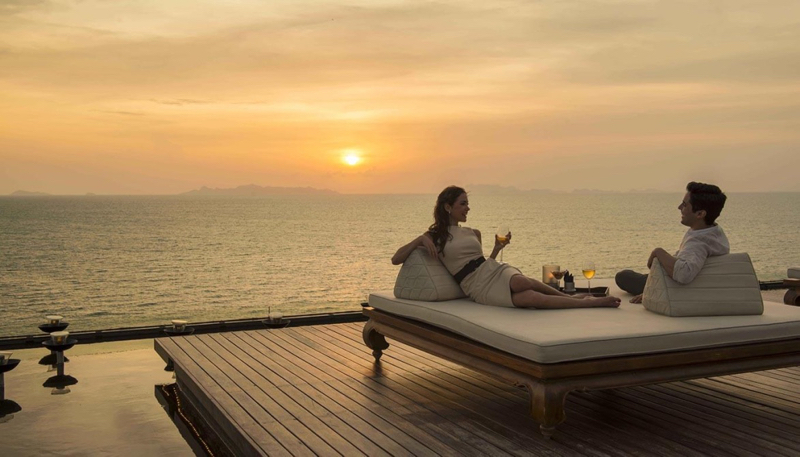 All the chilled seating areas are placed to maximise the panoramic view over the Gulf of Thailand. Cool tunes accompany the setting sun and then the candlelight creates a magical, serene ambience. Ask the Kalyana concierge to arrange your transport, or if you prefer to head there yourself, call ahead and book your pick up from the bottom of the mountain. It’s advisable not to try the drive yourself! The Ark Bar on Chaweng beach is the ultimate party bar with regular international DJs playing, it’s the best spot for party goers and a fun vibe. If you like banging tunes, the famous Samui ‘bucket’ and dancing barefoot on the sand as the sunsets, then you’ll love the Ark Bar. With a wide range of cocktails, local and international beers on offer, you don’t have to indulge in a bucket! Chill out on the shore line sun beds as your drinks are served to you, before joining the party crew in the beachfront bar. A ‘bucket’ is a small plastic bucket filled with your favourite spirit and mixer. It’s an amusing sight to see people dancing with a pink bucket, straws poking out, enabling sharing as you dance! Take a moment to look at the strange bits and pieces the hawkers are selling along the beach from lazer pointers to plastic nodding horses to bouncy sparkling balls! See http://www.ark-bar.com/ for events information. If you are hosting a wedding party, family reunion, corporate retreat or special celebration at Villa Kalyana and you fancy having a night out together then all the bars listed can be booked and a table reserved for you. 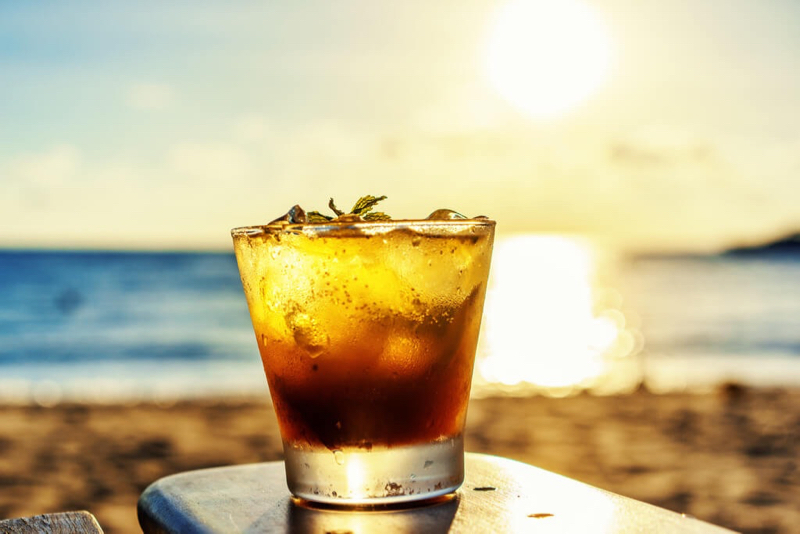 There is a particular favourite which ensures all the ingredients of great service, delicious cocktails and sunset, beachfront views. Your stay at Kalyana is probably going to include a trip to the main tourist town of Chaweng where the shopping is fun but undoubtedly requires a cocktail after. Why not reserve a table at the chic, cool Coast Beach Club to follow the shopping trip. Rest your weary legs, appraise your purchases and watch the sun set over gorgeous Chaweng beach. Large wicker sofas, double sunbeds with bouncy mattresses set out under canopies on the wooden deck is what you’ll find. As the sun dips over the horizon, torches are lit creating a magical atmosphere to accompany the acrobatic fire twirlers as the DJ sets the musical vibe.